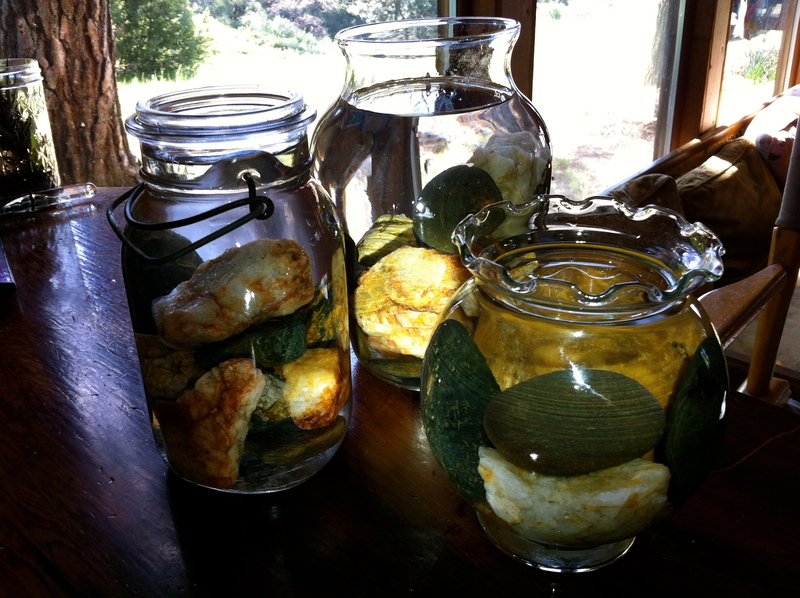 Make Beautiful Rock-quariums for Mother’s Day, or Any Day! Mother Nature shares her lovely gifts of rocks and water! Do you love the look of stones resting in water? There is something peaceful and beautiful about having little bowls of water and stones inside our house. They make delightful table decorations, and really shine when placed on a surface near a window, where the natural light spills in and lights up the colors of the stones. I adore rock-quariums! I used to collect stones when I visited my family on the east coast, and would leave one for them as a thank you gift when I left. Stones, quartz, granite, pebbles, and little rocks from our driveways, make great decorations. The very act of collecting them is a wonderful experience for adults and children alike, and they seem to add a peaceful air to our counters and tables. Place one in your bathroom for a little “moment” near your bathtub, or children can put one in their room. Why do they make us feel better? I suppose the beauty alone helps, or water and rock together being such a natural draw to our human spirits, or perhaps it is because rock can absorb negative energy? Does it matter? They are my most favorite simple project ever! Gather stones from your yard, parks, anywhere! 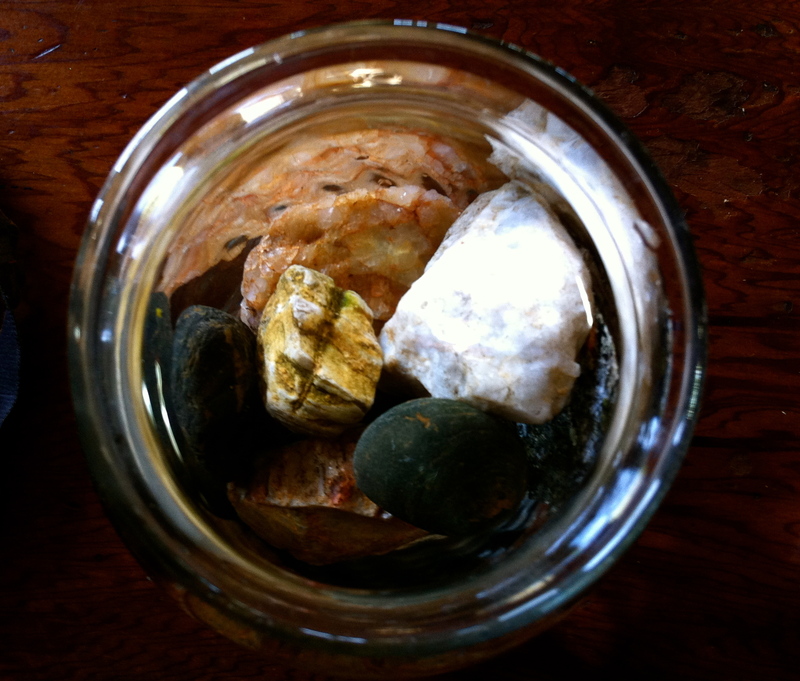 Scrub the rocks with soap and water, arrange them in a glass jar or vase, and fill with water. Voila! Change the water whenever it gets too cloudy and occasionally scrub the rocks off again if you need to. 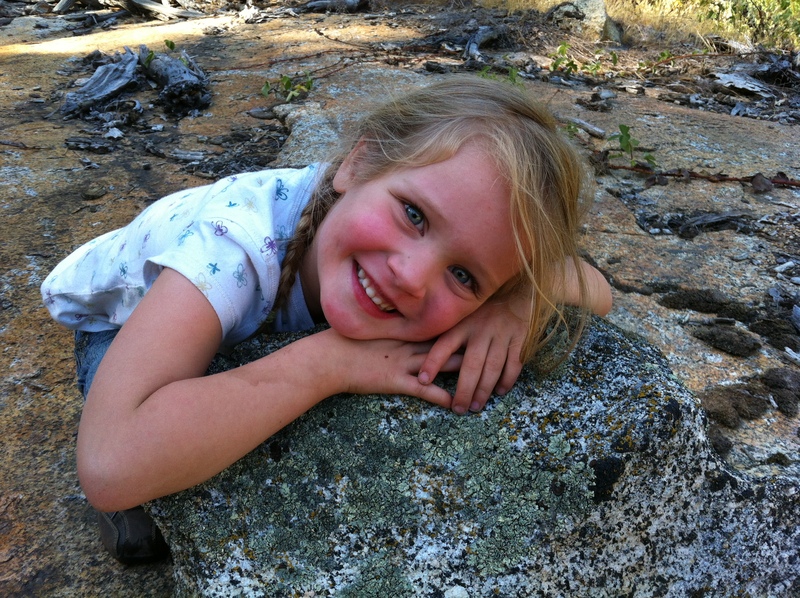 At a certain point we like to return all of the rocks to the great outdoors and make new rock-quariums another time. These make great gifts! Mother’s day is coming and I would much rather have a beautiful rock-quarium from my Captain, than flowers, candy or other presents! In fact, a rock-quarium next to a bathtub with a note that tells mom to take as long as she wants in there would be perfect! I purchased the vase with the frilled edge (on the right in the photo) at the dollar store. We also use old mason jars, jelly jars, etc. Another sweet idea is to make mini rock-quariums in the small, 8 oz mason jelly jars and put one at each guest’s place at the table, with one large one as the centerpiece. Sweet! We like to add plant cuttings, like manzanita or bear clover to them for table decorations as well. This is the simplest, most inexpensive, loveliest project I know. Nature rocks! 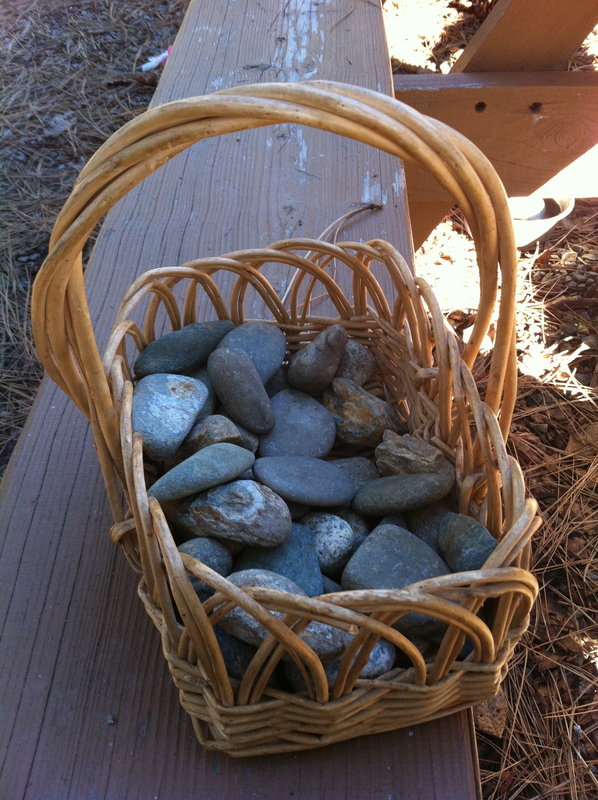 The best thing about this simple preschool project is collecting the rocks! The second best thing is getting to paint them. Kids don’t even realize that they are learning that there are 26 letters in the alphabet as it just kind of happens when you are outside on a beautiful day, toting around a little basket to collect rocks to paint. Captain collected, counted and sorted rocks outdoors at a picnic table. (It is helpful to look for smoother, flatter rocks.) As she spread out the rocks and picked her favorites, I gathered the materials. Lay out newspaper. Make a palette of colors on a white plate, using acrylic paints that include black for the letters themselves. I have small 2 oz bottles of acrylic paints that I purchased from Michael’s Crafts for about 99 cents. Have an assortment of brushes available and a small glass of warm water and a rag for rinsing the brushes in between colors. 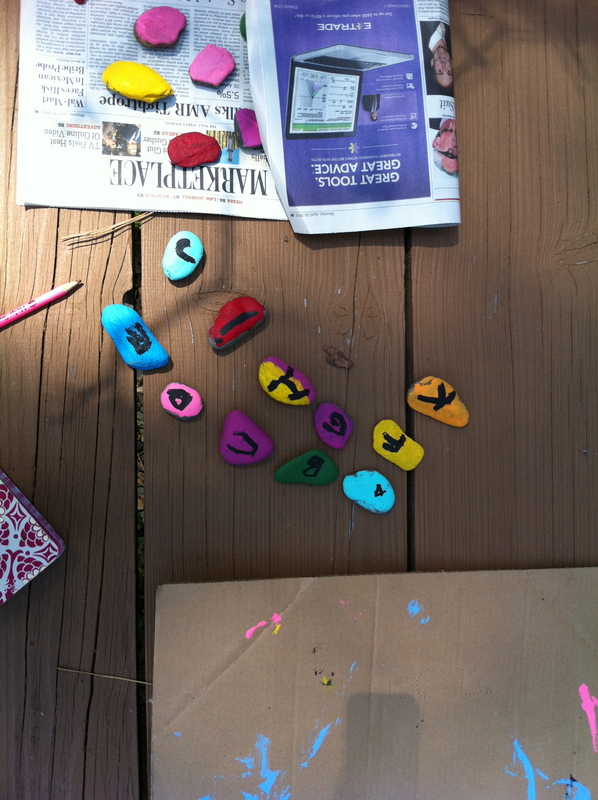 We found that painting all of the rocks with fun colors first, letting them dry, and then painting on the letters works best. You will want the kids to wear a paint smock or an old, stained tee shirt as the acrylics don’t wash out. Kids should be old enough not to put the brushes or paint into their mouths. 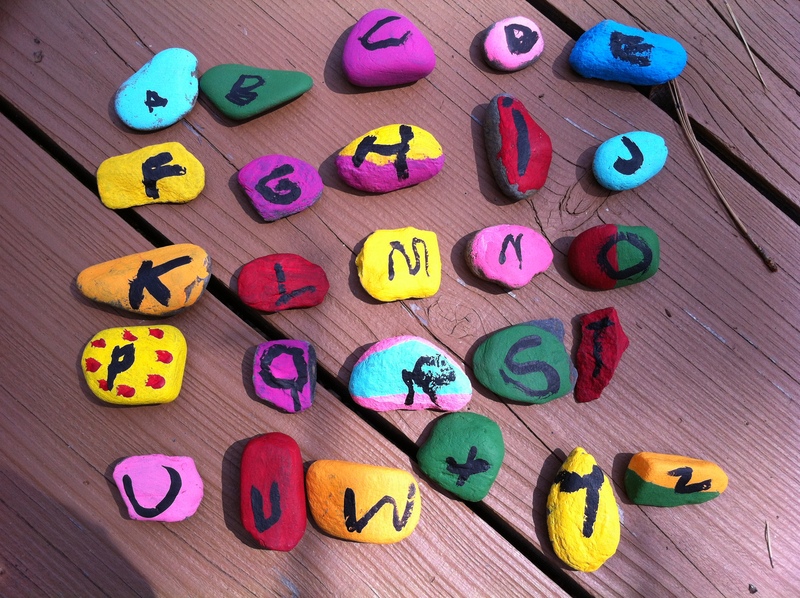 If they are still learning the alphabet and need some help, you can write the letters on the rocks with a pencil and let them paint over the top. We did this project on a sunny day and they dried quickly and turned out really cute! 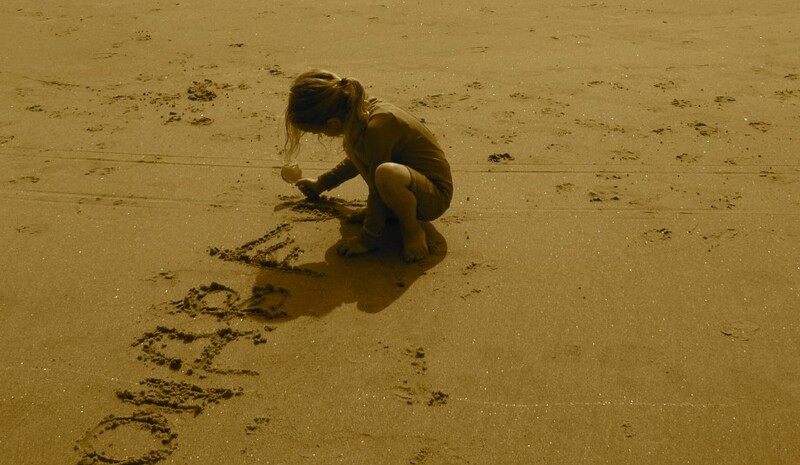 If you would like to share photos of your own Alphabet Rocks! project with us, we would love to see it! I remembered doing this project when I was a kid when I saw it listed on education.com. Thanks for the memories!